This series of documents are intended to help those that need additional information and support for specific topics of the blueprint for Cisco CCIE Routing and Switching practical exam, version 4.0. There are other documents and books out there that try to cover everything (or as much as they can) within a single book...my thought was "what if you don't need everything...what if you only want or need to work on Frame Relay or IPv6". That's what started all this, smaller, more focused documents that target specific topics. Buy what you need, not what you don't...or buy as you progress. Currently these documents are only available through Amazon for Kindle. You can either purchase a Kindle or do as I do and use the Kindle app for iPAD. If there is enough of a demand, I may end up offering a hard copy version, but as of now, only the Kindle version is available. These documents are in work, so as I complete them, I will post that they are available. I will most like release them slightly out of order compared to the blueprint, as complete a topic, I'll publish it. There may have to release updates as well, for type-Os, corrections, additions or due to changes to the blueprint. I'll post information about that if that occurs. Good luck in your endeavors, remember..."if it was easy, no one would care"! You'll have to edit it to point to your IOS. 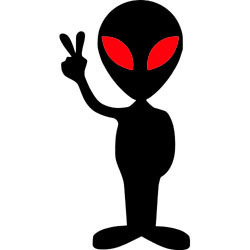 I will upload the baseline configuration files (that apply) shortly. It will be broken down by book. This document is intended for those that need addition work on binary and hexadecimal math as it relates to a CCIE level of study (and can help with any level of certification). This document is broken into phases, basic binary & hexadecimal numbers and math for review, with exercises. The use of numbers in networking, addressing, registers, access control lists. 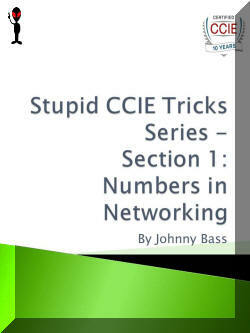 Examples and exercises for the use of numbers in networking. Advanced binary and hexadecimal numbering in networking, in other words how it might apply in a CCIE exam type of scenario. This document is intended for those that need addition work with frame relay as it relates to a CCIE level of study (and other certification that reference frame relay). 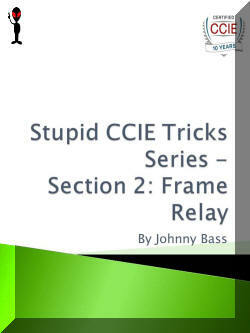 This document is broken into phases, frame relay basics, Cisco router configurations, advanced topics (or CCIE twists), troubleshooting, frame relay with routing protocols, CCIE Routing and Switching examples with sample exercises. Also included in this document is HDLC, and PPP, since I couldn’t find any better place to put them. This document is intended for those interested in attempting the CCIE Routing and Switching practical exam. As the name implies, Switching is a significant component of this exam. The candidates are not only expected to know the general operation of the switches, but how any feature of the switch could be used. A significant complexity is added in the different ways that the different switches within Cisco product lines operate for the same process. Currently the CCIE R&S equipment list only the Cisco 3560 switch, therefore the focus will be on that series of switch for this document. There is a section at the end that I’ve added to list the differences for the ME3400 switch, just for those interested in the CCIE SP exam, but the focus is how the 3560 might be used within the CCIE R&S practical exam. So, the goal of this document is to give the candidate an understanding of how switching could be used within the CCIE R&S practical exam, with a focus on the 3560 switch and therefore will hopefully help shorten the time spent configuring and troubleshooting switches within the exam. This document is intended for those that need addition work on RIP and RIPng as it relates to a CCIE level of study. This document is broken into phases, a bit of history, RIPv2, RIPng and a few exercises. We will look at the common features and some of the more obscure ones, in other words items that might apply in a CCIE exam type of scenario. Even though OSPF is the most popular interior gateway protocol, the best practices and common deployment limits how we use the protocol. Due to this practice in the industry, the less obvious features may be ignored; therefore CCIE Routing and Switching candidates are missing points on those features. This document is to cover the general operation of OSPFv2 & OSPFv3 and how they may be used within the CCIE R&S practical exam. The goal is to give the candidate an understanding of how OSPFv2 & OSPFv3 works and how they may be used within the CCIE R&S practical exam and therefore will help shorten the time spent configuring and troubleshooting OSPFv2 & OSPFv3 within the exam. There is an error in the exercise section of this book! Even though EIGRP is a very popular interior gateway protocol, only beat by OSPF due to the proprietary nature of EIGRP, the best practices and common deployment limits how we use the protocol. Due to this practice in the industry, the less obvious features may be ignored; therefore CCIE Routing and Switching candidates are missing points on those features. This document is to cover the general operation of EIGRP & EIGRPv6 and how they may be used within the CCIE R&S practical exam. The goal is to give the candidate an understanding of how EIGRP & EIGRPv6 works and how they may be used within the CCIE R&S practical exam and therefore will help shorten the time spent configuring and troubleshooting EIGRP & EIGRPv6 within the exam. We will look at the history of EIGRP, EIGRP in the CCIE exam, Basic and Advance configuration of EIGRP and EIGRPv6, and CCIE type exercises. Even though BGP is the exterior gateway protocol that makes the Internet work and is heavily used in larger enterprise networks as a core protocol. It is also used in the support of MPLS (which we will not going into great detail here about, see Stupid CCIE Tricks, section 10: MPLS for more). Typically the best practices and common deployment limits how we use the protocol and one goal is to setup BGP in the most simplistic way to make it more supportable, with that said, BGP is still configured typically in a more complicated way than the IGPs within the same network. Due to this practice in the industry, the less obvious features may be ignored; therefore CCIE Routing and Switching candidates are missing points on those features. You need to have a good understanding of how BGP works and what the options are and how to use them in ways they may not have been intended. You CANNOT pass your CCIE R&S lab without knowing BGP! This document will attempt to cover the general operation of BGP, but also how BGP may be used within the CCIE R&S practical exam. The goal is to give the candidate an understanding of how BGP works and how they may be used within the CCIE R&S practical exam and therefore will help shorten the time spent configuring and troubleshooting BGP within the exam. We will look at how BGP can be used to support IPv4 & IPv6 (both for unicast and multicast) and VPNs. We will look at the history of BGP in the CCIE Exam, History, Operational Overview, Configuration, Troubleshooting Tips and CCIE like exercises, in other words how BGP might apply in a CCIE exam type of scenario. Route redistribution within the “real” world is typically limited to a small number of protocols (like 2), with typical policies of default route injected in one direction and passing all routes in the other (pick a core, the other an edge protocol). Normally we use multiple protocols either due to mergers, acquisitions, scalability, legacy or politics. The typical scenarios are basic, to try and make it supportable and stable. This is not CCIE level behavior. CCIE redistribution could be some of the more complex, time consuming parts of the practical exam. The process to redistribute is fairly straight forward, it may be the number of routing protocols and methods required that make it complex. We will go through the process; the configuration and what I think are best practice to stabilize the network in the process. The only way to get good at redistribution is to practice, so there are exercises at the end of this document. Policy based routing (PBR) is, in some minds, a fancy static route. Normal routing is destination based, PBR can include source, protocol, ports, size and so on. Most PBR done in the industry is for niche issues, specific types of traffic needs to be treated in a specific way. Most cases, PBR is not heavily used. As in all other topics, we have to be concerned in the CCIE way of doing things, how might this apply to CCIE practical exam, so we will go through the process, configuration examples and then exercises. Cisco Optimized Edge Routing/Performance Routing is a relatively new feature within the Cisco arsenal of features and tends to be complex due to a) its newness and b) its seemingly constant change from version to version. Due to the amount of comments and changes by version, the OER/PfR section does hold a bit more than normal configuration guide reference. I try to throw my 2 cents in there two to try and help in the explanations. There are examples of configurations as well to help clarify. So, the goal of this document is to give the candidate a better understanding of how redistribution, policy routing and OER/PfR work and how they may be used within the CCIE R&S practical exam and therefore will help shorten the time spent configuring and troubleshooting these technologies within the exam. Due to the increase use or need for IPv6 in the industry, it’s becoming a more important technology within the enterprise, government and provider space. The CCIE Routing and Switching candidates are expected to understand and be able to configure IPv6, along with IPv4. In the past IPv6 point values were relatively low, but as the blueprint reflects more options and protocols, the number of points associated with IPv6 will increase. The anticipation and expectation is that IPv6 will become more of a core competency, rather than just an advanced topic on the R&S lab exam. This document is to cover the general principles and configuration that is linked to IPv6, but also more advance, not yet on the blueprint topics as well and how those topics (current and future) might be used within the CCIE R&S practical exam. Within this document, we will cover the basics of the protocol, addressing, routing protocols, services, tunneling, multicast, security, MPLS (possible future add) and how the 3560 switch supports IPv6. The goal is to give the candidate an understanding of the protocol, the differences and similarities to IPv4 and how it can be used within the CCIE R&S practical exam and therefore will help shorten the time spent configuring and troubleshooting IPv6 within the exam. Even though MPLS tends to be a service provider type of technology, there are more and more enterprise that are starting to implement their own MPLS cloud. It may be used in combination with BGP (which we will not go into great detail here about, see Stupid CCIE Tricks, section 9: BGP for more). Typically the best practices and common deployment limits how we use the protocol and one goal is to setup MPLS in the most simplistic way to make it more supportable…with that said, MPLS has the potential of being complicated, depending on features that needs to be implemented. Due to this practice in the industry, the less obvious features may be ignored; therefore CCIE Routing and Switching candidates are missing points on those features. You need to have a good understanding of how MPLS works and what the options are…and how to use them in ways they may not have been intended. This document will attempt to cover the general operation of MPLS, but also how MPLS may be used within the CCIE R&S practical exam based on the version 5.0 blue-print. troubleshooting MPLS within the exam. We will look at how MPLS can be used to support IPv4 with Layer 3 VPNs. We will look at the history of MPLS, how it relates to the CCIE R&S Exam, Operational Overview, Configuration, Troubleshooting Tips and CCIE like exercises…in other words how MPLS might apply in a CCIE R&S exam type of scenario. Hope to have it done by mid to late June 2013.